Walvis Bay (Afrikaans Walvisbaai, German Walfischbucht or Walfischbai, aw meanin "Whale Bay"), is a ceety in Namibie an the name o the bay on which it lies. The ceety haes 43,700 indwallers an awns 29 square kilometres (11 sq mi) o land. The bay haes been a haven for sea vessels acause o its naitural deepwater harbour, protectit bi the Pelican Point saund spit, bein the ae naitural herbour o ony size alang the kintra's coast. Bein rich in plankton an marine life, thir watters an aa drew lairge nummers o whauls attractin whaulers an fishin veshels. The Dutch referred tae it as Walvisch Baye an the Inglis as Whale Bay. In its eventual proclamation it came tae be cried Walfish Bay, an ultimately Walvis Bay. It haes an aa been referred tae as Walwich Bay or Walwisch Bay. A succession o colonists developed the location an resoorces o this strategic harbour dounset. The harbour's value in relation tae the sea route aroond the Cape o Guid Howp haed caught the attention o warld pouers syne it wis discovered. This explains the complicatit poleetical status o Walvis Bay doun the years. The toun is situatit in the Kuiseb river delta an lies at the end o the TransNamib Railway tae Windhoek, an on the B2 road. Walvis Bay, wi its lairge bay an saund dunes, is the tourism activity centre o Namibie. Ither attractions include the airtifeecial Bird Island, centre o a guanae collection industry, the Dune 7 saund dune, salt wirks, birdlife an a museum. Kuisebmund Stadium, hame tae twa clubs in the Namibie Premier League, is an aa locatit in the ceety an the beach resort o Langstrand lies juist a few kilometers north. The Walvis Bay Export Processing Zone is an important facet o the local economy. Portuguese navigator Diogo Cão reached Cape Cross, north o the bay, in 1485. He wis follaed bi Bartolomeu Dias, who anchored his flagship São Cristóvão in wha is nou Walvis Bay on 8 December 1487, on his expedeetion tae diskiver a sea route tae the East via the Cape o Guid Howp. He named the bay "O Golfo de Santa Maria da Conceição." Housomeivver, the Portuguese did no formally stake a claim tae Walvis Bay. Little commercial development occurred on the site till the late 19t century. Durin the scramble for Africae, the Unitit Kinrick annexed Walvis Bay an a sma aurie surroondin the territory in 1878 tae the Cape Colony baith tae forestaw German ambitions in the region an tae ensure safe passage o Breetish ships aroond the Cape. 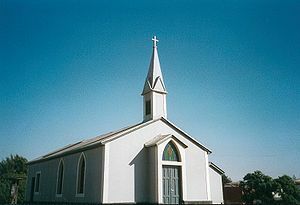 In 1910, Walvis Bay, as well as the Cape Colony, became pairt o the newly formed Union o Sooth Africae. Housomeivver, a dispute arose wi Germany ower the enclave's bundaries. 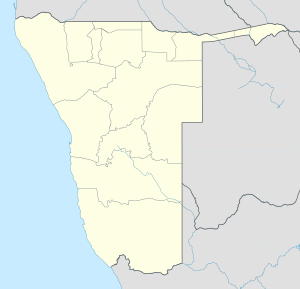 This wis eventually settled in 1911 an Walvis Bay wis allocatit an aurie o 434 square miles (1,124 km2). The enclave wis owerrun bi the Germans durin the Sooth-Wast Africae Campaign early in Warld War I. But Sooth African Forces eventually oostit the Germans in 1915 an Walvis Bay wis quickly integratit intae the new martial law regime establisht in Sooth-Wast Africae. Sooth Africae wis later awardit control (a "C" cless mandate) ower Sooth-Wast Africae bi the League o Naitions tae admeenister SWA as an integral pairt o Sooth Africae. Ceevilian rule wis restored in Sooth-Wast Africae in 1921 an admeenistration o Walvis Bay wis transferred tae SWA bi Act o the Sooth African parliament in 1922. In 1971, anticipatin an imminent cedin o its control ower Sooth-Wast Africae, Sooth Africae transferred control o Walvis Bay back tae its Cape Province, sicweys makin it an exclave. In 1977, in an attempt tae avoid losin control o Walvis Bay tae a possibly hostile SWAPO-led govrenment, the Sooth African govrenment reimposed direct rule an reassertit its claim o sovereignty based on the oreeginal annexation. In 1978, the Unitit Naitions Security Cooncil providit for bilateral negotiations atween Sooth Africae an a future Namibie tae resolve the poleetical status o Walvis Bay. In 1990 Sooth-Wast Africae gained unthirldom as Namibie but Walvis Bay remained unner Sooth African sovereignty. At midnicht on 28 Februar 1994 sovereignty ower Walvis Bay wis formally transferred tae Namibie, as wur the Penguin Islands. In Walvis Bay thare are a nummer o public (govrenment-run) an private schuils. Examples o sic schuils are Duinesig primary schuil, De duine seicontary schuil, Internaitional Schuil o Walvis Bay, Kuisebmond seicontary schuil, Walvis Bay Private Heich Schuil an ithers. Thare are an aa a nummer o kindergartens tae cater tae young childer. Tertiary institutions sic as NAMFI (dedicatit tae the trainin o deck officers, fishermen, marine ingineers an ither careers in fishin an unner-watter wirk), Monitronic success college an IUM an aa exist. In Walvis Bay thare are different fishin companies lik Hangana Seafood, Caroline Fishing, Benguella Fishing Company, Etale Fishing Company, Cadilu Fishing, Etosha Fisheries, Kuiseb Fishing Enterprises, Blue Ocean Products, Benguella Sea Products, Consortium Fisheries. Thir companies catch different types o fish lik snoek, horse mackerel, anchovy, steenbras, kabeljou, kingklip, hake, catfish, tuna, an sardines. Hangana Seafood are processors an exporters o fish an fish products. It is hame tae Eleven Arrows F.C., a local fitbaa club that competes in the Namibie Premier League. Walvis Bay features the vera rare mild variation o the arid climate. 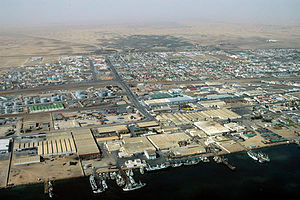 Walvis Bay receives an average o less nor 10 mm o precipitation per year, makin it ane o the driest ceeties on the planet. Despite the fact that it haes an arid climate, Walvis Bay seldom gets vera het or vera cauld, an extremely unuisual featur for a ceety featurin this climate. This is primarily due tae cauld affshore currents near Walvis Bay. Temperatures averages aroond 24 °C durin Januar, Walvis Bay's warmest month an aroond 17 °C durin Julie, its cauldest month. ↑ "Table 4.2.2 Urban population by Census years (2001 and 2011)" (PDF). Namibia 2011 – Population and Housing Census Main Report. Namibia Statistics Agency. p. 39. Retrieved 10 September 2013. ↑ Diffie, Bailey (1977). Foundations of the Portuguese Empire, 1415–1580, p.156. University of Minnesota Press. ISBN 0816607826. Wikimedia Commons haes media relatit tae Walvis Bay.